Been a while since I did one of these "3 Dinners" posts. But then, it's been a while since I cooked at home consistently. (Oven chips don't count). This post's theme is "healthy". This one is from Jamie's Ministry of Food, and seemed like one of the healthier curries we could enjoy - no coconut milk or cream involved. I found the Curries chapter of this book really useful. Jamie suggests using bought curry pastes (good for time-poor or beginners, but also has recipes for making curry pastes from scratch). As you'll see from the first picture in this post, I went for the more laborious version. (I also couldn't find Jalfreezi curry paste at the supermarket. I got a jar of Jalfreezi simmer sauce, but I'll save that for a time when I need a quick quick dinner). 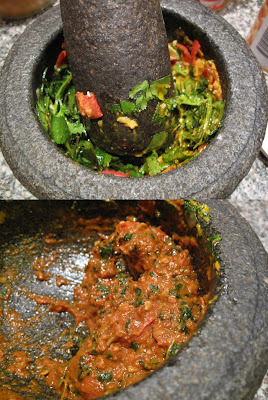 Even if you do make the curry paste from scratch, it's pretty easy, especially if you already have all the spices (y'all know I do, haha) - just a lot of chopping and stirring. It smells a-mazing when you're frying off the paste and the onion/garlic/chilli mix. Simmer those veggies with stock and tomatoes for an hour or so, cook some rice, and dinner is ready. Because we happened to use yellow peppers (cheaper at the market), the finished product was a gorgeous Mika-style Golden Golden curry. Fabulous. I fried the fish on both sides to get it brown, drizzled with oil and lemon zest, and finished it off in the oven. In the meantime I steamed some kipflers, sliced them, and drizzled them with a mint salsa (mint, parsley, capers, cornichons, olive oil, white wine vinegar) whilst still warm so they could soak up all the flavours. Yum yum. Served with leftover superfood salad. We had a couple of rack-of-lamb leftover from Father's Day dinner (still to be blogged), so in the interest of thrift, later that week I sliced them into individual lamb cutlets, and grilled them on both sides. We served it with a kinda cross between the Superfood Salad and Jamie Oliver's chop salad - i.e. put all ingredients on a board and chop chop chop until it's mixed. The chopped ingredients included spring onions, cucumber, parsley, mint, and cos lettuce. I added a few tablespoons of red quinoa, mixed seeds, pine nuts and avocado, and dressed it with a mixture of lemon juice and buttery rapeseed oil. (Horrible name, lovely oil - tastes like popcorn but full of healthy-heart oils). With that, I made brown rice, and topped it with finely-sliced red onions, cooked until soft and sweet. Asian parents don't like non-white rice, so I had to make it at least a little interesting for them! I love making curries from scratch, and as you wrote, if you've got the ingredients on hand, it's neither hard or time consuming. And yes, there is nothing like the smell of frying off the paste. Although if you've got enough chilli in it, it can still bring a few tears to the eyes. I had a friend in the UK who offered me a curry paste recipe from a chef. IT used over 40 spices!